We’re pleased to present you with the eleventh edition of the MoneySense Dividend All-Stars. It serves up a new crop of the best blue-chip dividend stocks in Canada while harvesting a decade’s worth of gains. If you had purchased an equal dollar amount of each A-graded Dividend All-Star and rolled the proceeds into the new ones each year, you’d have gained a total of 178%, including dividends, since we started way back in 2007. Similarly, a portfolio of A-and-B stocks would have climbed 119%. By way of comparison, the S&P/TSX Composite Index ETF (XIC), which tracks the broad Canadian stock market, lagged with a total return of 47% over the same period. 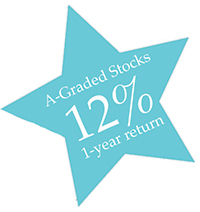 The A-graded stocks beat the market index by an average of 6.6 percentage points annually since we started. More recently, the A-graded stocks gained an average of 12% since last year’s update. In an unusual, but by no means unique turn of affairs, the larger group of A-and-B-graded stocks fared better with gains of 16% on average. Both handily beat the S&P/TSX Composite ETF (XIC), which advanced 5% over the same period. We’re happy with the results and they help to emphasize market research that has extolled the virtues of dividend stocks for a long time. For instance, Dartmouth professor Kenneth French studied stock picking strategies globally and his numbers demonstrate that dividend stocks have fared particularly well in Canada. In one study, Professor French sorted Canadian stocks by dividend yield at the end of December and put them into three portfolios. The first portfolio held the 30% of stocks with the highest yields and the second contained the 30% of stocks with the lowest yields. The final portfolio tracked stocks that didn’t pay dividends. The portfolios were followed for a year and then the process was repeated. The accompanying figure shows the growth of each portfolio along with that of the Canadian stock market. The high-yield stocks outperformed the market by an average of 4.1 percentage points a year from 1977 through to the end of 2016, which really adds up. The low-yield group underperformed by 0.7 of a percentage point annually over the same period. We’re struck by the horrible returns generated by the no-dividend group, which trailed the market by an average of 7.5 percentage points a year from 1977 through 2016. Sure, the group rocketed higher in the late 1970s when resource companies boomed, but it peaked in 1981 and then crashed. Shockingly, the portfolio of non-dividend payers has yet to eclipse its 1981 highs. Aside from strong past performance, focusing on dividends can lead to behavioural benefits for investors. Problem is, bear markets cause a great deal of distress and they can prompt investors to sell rashly. But investors who pay attention to dividend yields will notice that yields rise when stock prices fall. The higher yields may encourage them to load up—or at least stay invested—during bear markets when prices are low. At least, that’s the theory. When picking dividend stocks we evaluate each candidate based on its yield, reliability, and value. You can read all about the process over here, but we boil everything down to an easy to use letter-grade that sums up a stock’s investment potential. Stocks with the best prospects are awarded As and solid candidates get Bs. We think both are worthy of your consideration. Middle of the road options get Cs, while those in need of improvement get Ds or Fs. A select group of seven of stocks managed to earn As this year, while 15 picked up solid Bs. Use our grades as the starting point for your own research. Before buying any stock, make sure its situation hasn’t changed in some important way and that it’s right for your portfolio. Read the firm’s latest press releases and regulatory filings. Scan reputable media stories to make sure you’re up to speed on important developments and breaking news. While we’re pleased with our long-term track record, we can’t guarantee that you’ll make a fortune with every A- or B- graded stock. The market is just too unpredictable for that. Nonetheless, we do think they deserve your attention and further research. Look beyond the grades and think about the unique or intangible features of each company. Such factors can be beneficial, like a recent technological development. But they can also be detrimental, like the sudden arrival of new competition. Similarly, we’re in an aging bull market, which means that you should be prepared to take advantage of a market cool down, should one occur. Be careful out there. Norm Rothery, CFA, PhD, tweets as @NormanRothery. He may hold some of the securities mentioned in this article.